I just checked out the stomachs of 2 red-tailed surfperch and 2 silver surfperch. The red-tails were both males. 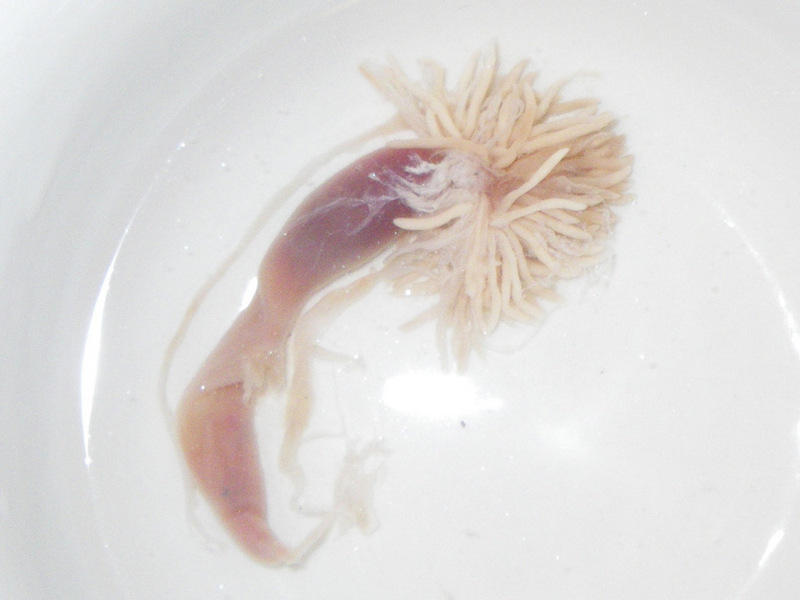 One had an empty stomach and the other, a 9 1/4″ male had consumed the interesting creature in this photo, an anthozoan of some kind (it’s about 2″ long), or a worm, along with some other indistinguishable stuff including something that looked a lot like part of a jellyfish. If anyone can tell me what this organism is, that would be great. One of the silver surfperch, a 6 3/4″ female, had several indistinguishable items in the upper gut. A 6 1/2″ male’s stomach contained scads of tiny brown crustaceans. It wasn’t clear to me if the fish had eaten the tiny crustaceans or if they were in the gut of something else it had eaten (some of them seemed to be in the gut of another, mostly digested organism. The stomach also contained something that looked like gill rakers or the feeding structure of a barnacle.